Strip-tillage offers the advantages of no-till with the bonus of earlier planting dates. It’s a tillage practice we know is likely to increase your profitability. How? We practice strip-till in our own farming operations and have experienced its benefits firsthand. 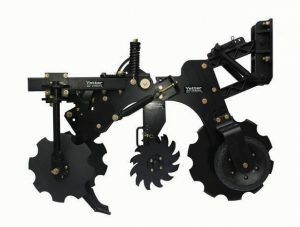 It facilitates precise nutrient placement and produces huge savings in terms of time, water, equipment, and fuel costs. SOIL Service offers the Yetter Maverick™ HR Plus®, a strip-till tool that adds more clearance around the residue manager and the knife to run through residue—even cornstalks—without any plugging problems. The independent disc sealer wheels offer infinite adjustments, and the independent gauge wheels offer adjustable depths to make this a versatile tool for changing ground conditions. Use this product for both your fall and spring operations. The Maverick HR Plus is available for application of dry fertilizer, liquid fertilizer, anhydrous, or any combination.